A. 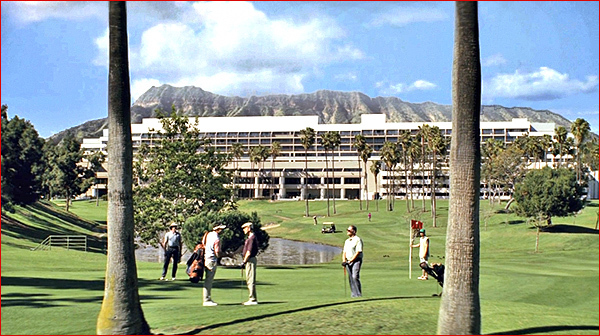 The mountain seen in the background is Diamondhead, which means that this golf course is supposed to be on the Hawaiian island of Oahu, perhaps in Honolulu. A. At 23:35, in Episode 2, ("Pineapple"), where we see Colin Belfast ( Bobby Cannavale ) pushing his way through a golf course, while characteristically talking on the phone. He eventually emerges on the green, where he greets some corporate types (whom he may have been stalking). A. A golf course, but a long way from Hawaii. A. 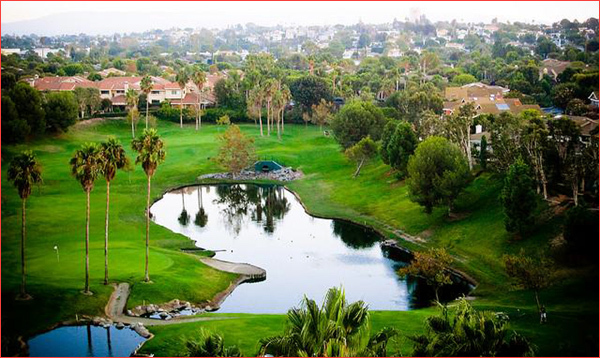 This is actually the golf course at the Marriott Hotel in Manhattan Beach, at 1400 Parkview Avenue, in Manhattan Beach, California. 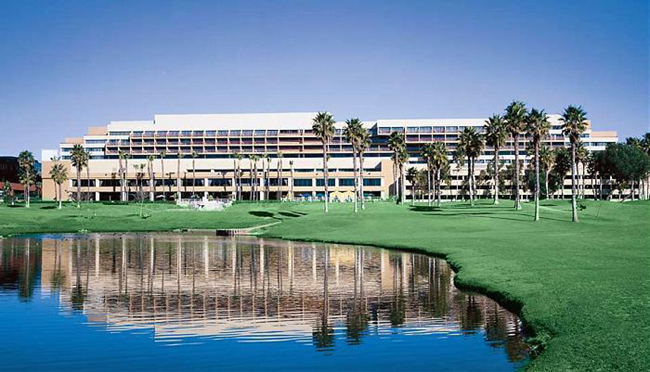 And in the shot above, that large, white corporate-looking building seen behind the golf course is actually the back of the Marriott hotel, and the camera is looking north across the course. The hotel is apparently undergoing a major renovation, and there is currently a wall around it, announcing that the hotel's new name will apparently be "Westdrift Manhattan Beach ( a Marriott Autograph Collection Hotel )". The upscale hotel features 393 luxury guest rooms, including 15 suites. Manhattan Beach is one of three independent, well-to-do beach cities (along with Hermosa Beach and Redondo Beach) found along L.A.'s west-facing beaches, between LAX and the Palos Verdes Peninsula, about 13 miles southwest of downtown Los Angeles. This particular property is located inland, less than two miles from the beach, just east of the Manhattan Village Mall. A. Fortunately, I had tracked down this golf course once before, years ago, when I was tracking the locations for "The O.C." So I recognized it when I saw it again. There were a number of scenes on "The O.C." showing Sandy playing golf, and that show used three different golf courses over the run of that show. One of them was this same Marriott course in Manhattan Beach. You can read about those golf scenes on my old page here.